It's almost haloween!So,my topic for today is all about spookiness!I remember my chilhood days,this was the time that my friends talk under the starry starry night about ghost,aswang,tyanak,kapre etc...na kesyo pag ganitong tym eh nakikinig daw sa kweba ang mga di kanais-nais na nilalang na toh...Syempre bata pa ako that time kaya I super believe naman,na kahit I want to pee na pag gabi ay tina-try ko pigilan kc I'm afraid...And during this time also ay may segment pa si Kabayang Noli na about sa mga experience ng mga people sa aswang with matching re-enactment pa!Haha..kaloka kasi nakakatakot talaga...But now that I'm old,we just go to the cemetery.Pray.Go Home.Iba talaga pag bata pa..Those are the day!I miss it...Well now I have the reason to be spooked again kasi may nakita akong lil' devil!! 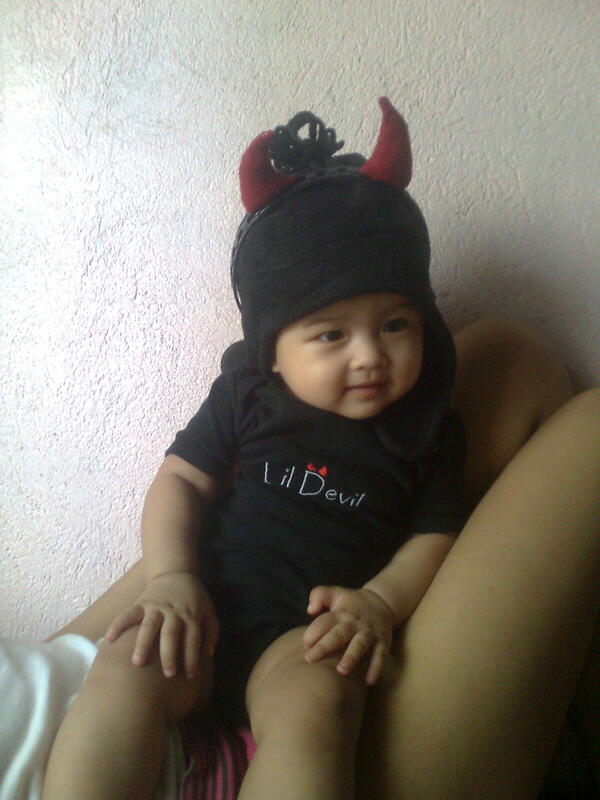 !And I would like to introduce to you my lil' devil!...Dyaran! She looks so cute. Good luck in the contest. Thank You Dear!Unfortunately the contest was only for babies residing in Metro Manila...and where here in the province. :( But this pic of my baby was posted in their contest page.Newi,thank you for visiting my blog!